This is Addiction RC Rodeo Special Kit 1/10 Clear Body Parts Full Set For ABC Hobby Nissan Rocket Bunny 180SX. 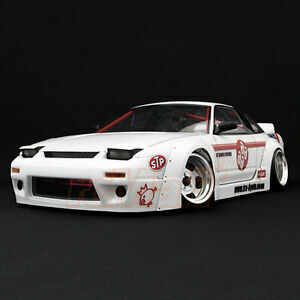 For: ABC Hobby Nissan 180SX. ABC Hobby Nissan 180SX. AD004-5 Duck Tail wing (1 pc). Clear protective film to prevent overspray: Yes.